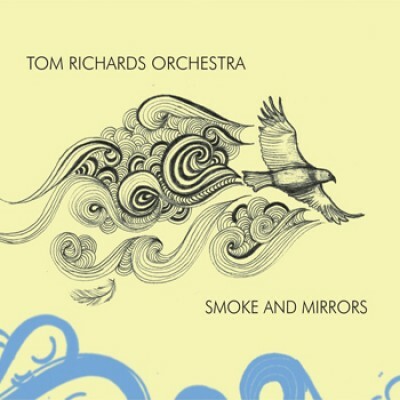 'Smoke and Mirrors' is the debut album from the Tom Richards Orchestra, featuring 5 original compositions by the band leader Tom Richards as well as one unique collaboration co-written with and featuring Jamie Cullum on vocals. The TRO is a unique 19 piece jazz orchestra comprised of London’s most sought after young musicians including Gareth Lockrane (flutes), conductor Jules Buckley and BBC Jazz Awards winners Gwilym Simcock (piano) and Jim Hart (vibes). This orchestra is truly an ensemble of international stature and a who’s who of the UK’s current vanguard, as many of the TRO alumni are leaders of successful projects in their own right. With this CD Tom takes a giant step forward from being one of the UK’s leading young saxophonists to acquiring his own one-of-a-kind sound that goes far beyond that of the average big band.